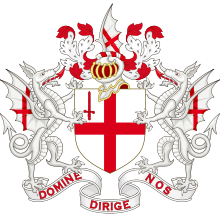 The flag of the City of London is based on the flag of England, having a centred red St George's Cross on a white background, with the red sword in the upper hoist canton (the top left quarter). The sword is believed to represent the sword that beheaded Saint Paul who is the patron saint of the city. The tip of the sword always points upwards; therefore, when the flag is held on its side as a banner, the sword would be printed to face hoist and would be located on the left as it is hanging down (see below). This flag does not represent Greater London (which does not have its own flag, aside from the banner of the arms of the former Greater London Council), only the historical City of London which covers approximately 1 square mile (2.6 km2). All references in this article relate to that city, not Greater London, unless specified. The flag is a banner of arms, derived from the city's coat of arms with the sword symbolising the sword that beheaded Saint Paul who is the patron saint of the city. Saint Paul has featured as a symbol of the city since about the 13th century. His full figure representation was rapidly replaced with his symbolic representation of the sword. The flag flies from various buildings in the city such as the formal buildings of Guildhall (the seat of power in the city) and Mansion House, the official residence of the Lord Mayor of London (the Lord Mayor has a variant of the flag, defaced with his coat of arms). It can also be seen on sites outside the city that are administered by the City of London Corporation (the governing body) such as on Tower Bridge, the Animal Reception Centre at Heathrow Airport and Hampstead Heath. It can also be seen on certain landmarks, such as the bridges maintained by the Bridge House Estates. The flag is used on the one pound coin design of 2010.